This website is the most comprehensive online guide to the Everest Base Camp Trek. On it you will find all the information you need to trek safely and successfully in the region. On this page we provide a general overview to the Everest Base Camp Trek, along with many links to further reading on topics like: Altitude Sickness, Packing Lists, Route Variations and many FAQs! The iconic Everest Base Camp Trek leads you through the Khumbu Valley, allowing you to experience the immense beauty of the surrounding Sagarmatha National Park while simultaneously providing breath-taking vistas of 4 of the 6 highest peaks in the world – My. Everest (8.848m), Mt. Lhotse (8,516 meters), Mt. Makalu (8,470 meters) and Cho Oyu (8,201 meters). The classic trek retraces the footsteps of Sir Edmund Hillary, Tenzing Norgay and the countless other early pioneers of Mount Everest as you trek from Lukla to the Base Camp. 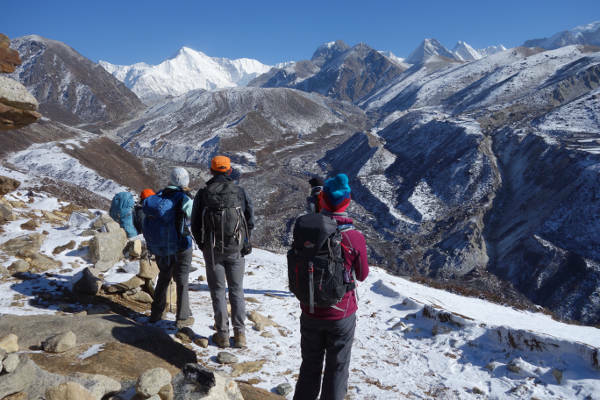 As a teahouse trek you will stay in some of the highest villages in the world as you explore the local culture and traditions of the native Sherpas by learning about their spiritual connection with the mountains. On the trek you will have the chance to ascend Kala Patthar, reaching an altitude of 5,500m and witness awe-inspiring views of Mount Everest. You will also have the chance to explore the various Buddhist monasteries dotted along the trail and learn about a culture steeped in history and tradition, inextricably linked to the very mountains on which you have unforgettable views. Below we have provided a brief overview of the classic route itinerary, with regional and trekking maps. 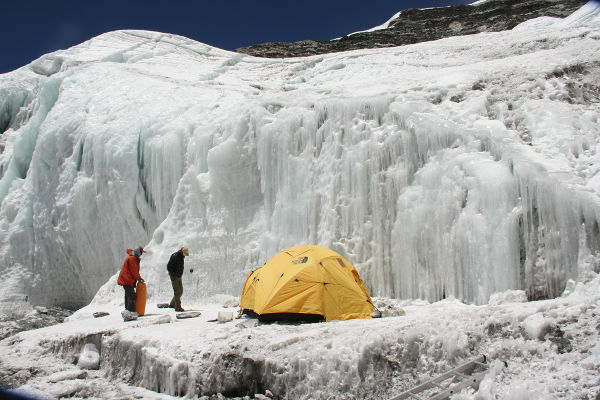 We have also answered some of the most frequently asked questions on the logistics of the trek, permits, tour guides, weather, insurance, cost, difficulty and what to pack. All treks in the Everest region are located within the orange rectangle on the map below. The block represents the Everest or Khumbu region of Nepal and shows its location in relation to Kathmandu, where flights to and from Nepal arrive and depart. The starting point of the Everest Base Camp Trek, Lukla, is also visible on the map. Other variations of the trek which don’t involve flying to Lukla generally start at Jiri – you can read more about this route variation here. 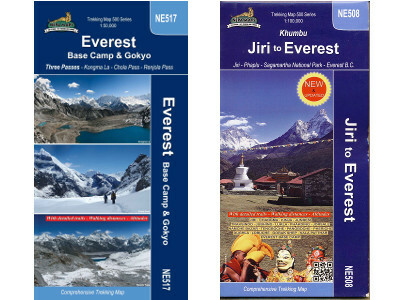 There are many great trekking maps for the Everest Region. Some take in the Gokyo region, whereas others cover Jiri and further Southern and Western aspects of the region. The classic route starts at Lukla in the south, then heads north to Namche Bazaar where its forks to the north-east and makes its way to Pheriche/Dingboche. From there it continues along the right fork through Lobuche to Gorak Shep. The Everest Base Camp is slightly further east and the view point of Kala Patthar can be seen to the west. 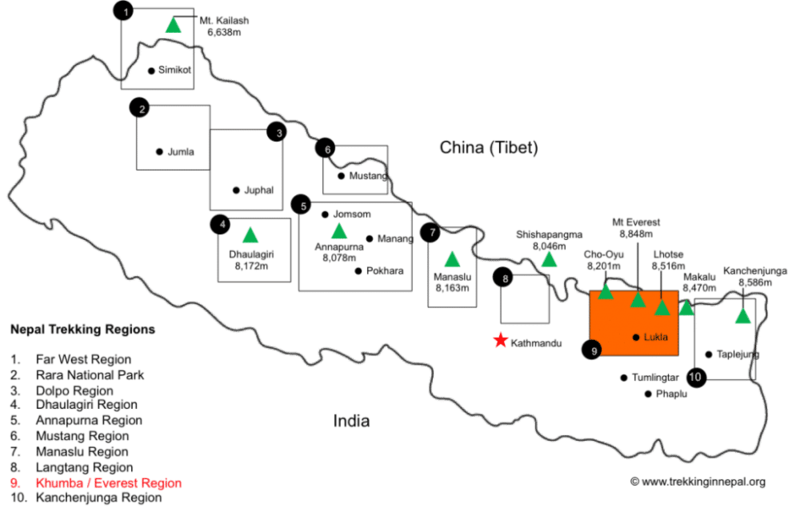 Variations of the trek can also be seen, such as the Gokyo Lakes Trek, which branches west at Namche Bazaar early in the trek and hugs the leftmost route as shown on the map schematic below. The Kala Patthar variation can be seen as the short dotted line leading north from Gorak Shep, which provides glorious views of the peak of Everest as well as surrounding peaks. The graph below shows the altitude profile for the classic Everest Base Camp Trek. The order of the names on the horizontal axis shows the typical progression of the hike with the major stops on the way. The graph makes it easier to see the gradual ascent and more rapid descent of the trek. We recommended taking a detailed guidebook with you on the trek. 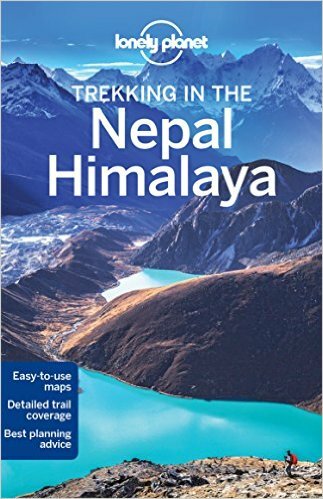 The Lonely Planet Trekking in Nepal Himalaya guidebook is updated regularly and is a well-known, trusted resource used by many trekkers worldwide. The guide is very detailed and contains information for many treks, meaning you can use it more than once! The classic Everest Base Camp Trek starts in Lukla and leads you through the Khumbu Valley to the Everest Base Camp situated on the south-side of Mount Everest. Most trekker’s adventures, however, begin in Kathmandu where the international airport for Nepal is located. From there it is a short, yet unforgettable flight into Lukla from where you will start the actual trekking (try get a seat on the left hand side of the plane for best first views of the Himalaya). The entire journey including the trek typically lasts between 14 and 16 days, with 12 days on the trail. Of these 12 days, 2/3 will be spent acclimatising to the high altitude, so 9-10 days of actual trekking can be expected. For those who don’t want to start their trek by flying into Lukla Airport, the Jiri to Everest Base Camp Trek variation provides a unique alternative. This trek starts with a bus ride from Kathmandu to Jiri from where the trekking starts. Because Jiri is considerably further away than Lukla, this variation will add around 5 days onto the trek. Here is a standard itinerary for a 14-day Everest Base Camp Trek experience. If you have organised a trip with a tour operator they will usually provide airport transfers, otherwise there are loads of taxis available at the airport. Top tip: make sure to agree a price before getting in the taxi. Meters are sometimes used, but rare. 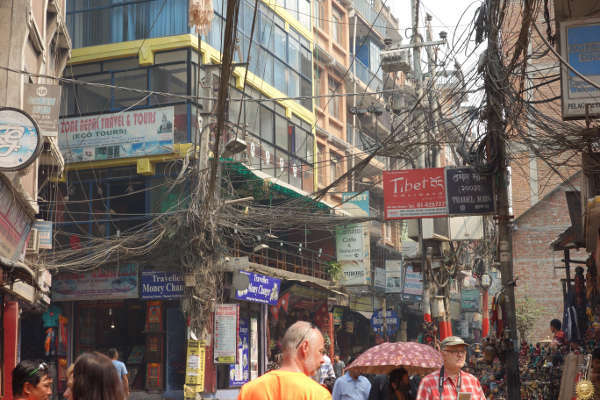 We recommend staying in Thamel (which is about 15 minute drive from Kathmandu airport). There are many hotels in Thamel, Kathmandu, with varying degrees of hospitality. Weather permitting you will fly from Kathmandu International Airport to Lukla in the morning. Flights to Lukla are prone to delay due to weather. We recommend building as much flexibility into your itinerary to cater for delays (i.e. having a day or two spare after the trek). If trekking with a tour operator they will have arranged your flight, otherwise you can purchase tickets at the airport for around US$250-$300 return. If you are taking a guide the cost of his flight with be charged at a local rate of about $100 return. Expect a nerve-racking flight into the famous Lukla Airport that provides great views of the region and of Everest – try to get a seat on the left side of the plane. Once landed, you will start the trek to the village of Phadking – on the way you will pass incredible boulders, carved with Buddhist prayers. This day will be spent trekking from Phadking through Mojo, ending up in Namche Bazaar. Some people cut this day short by stopping in Mojo (if you do the Mount Kailash Teahouse is great, and offers hot showers!). 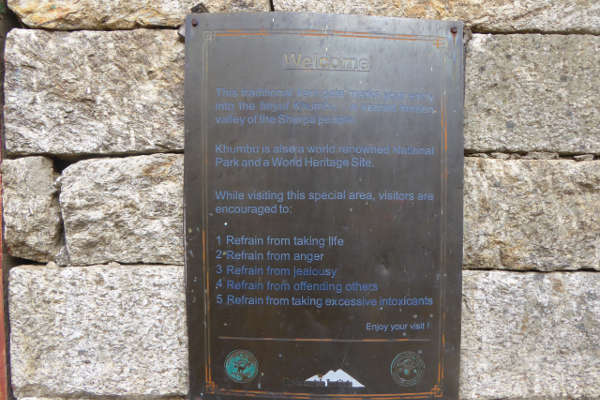 You will enter the Sagarmatha National Park (a UNESCO World Heritage Site) on this day. You will have plenty of time spent in Namche Bazaar – a small Sherpa market town, with countless sightseeing opportunities including the potential to catch your first glimpse of Everest. At close to 3,500m, Namche Bazaar acts as an important acclimatization stop while doubling up as an opportunity to explore the village and surrounding areas. If it happens to be a Saturday, be sure to check out the market. Most tour guides will take you on a short acclimatization trek to the Everest View Hotel. If it’s a clear day you should be able to snap some awesome pics of Ama Dablam in the foreground, and Mount Everest in the background. The hotel also provides WiFi at a cost so if you’re looking to call back home or just to connect, bring your device with you. For more information on internet on the trek, check out our detailed article. The day is spent trekking from Namche Bazaar to Tengboche, the home of the Tengboche Monastery – the largest in the region. Some variations will take you through the ancient Tibet-Nepal trading route over the Nanpa La pass to Thami. The next stop on the trek is Pheriche – the home of the Himalaya Rescue Association. The route takes you through Phangboche, which offers amazing views of Ama Dablam towering above you. Pheriche is usually used as a stop for the second acclimatization day. There are various activities to do in the area. Tshola Tsho Lake is a popular destination for trekkers stopping in Pheriche. Your tour guide might even take you to the nearby village of Dingboche where you will be able to see great views of Lhotse and Island Peak to the east. Dingboche is used as the start to the variation trek to Island Peak. This day is long and is spent climbing over 600m from Pheriche to Lobuche. On the way, you will pass the well-known Khumbu Glacier as well as various memorials to those Sherpas and climbers who have died on Everest. Hike from Lobuche to Gorak Shep, the highest permanently inhabited village in the world. 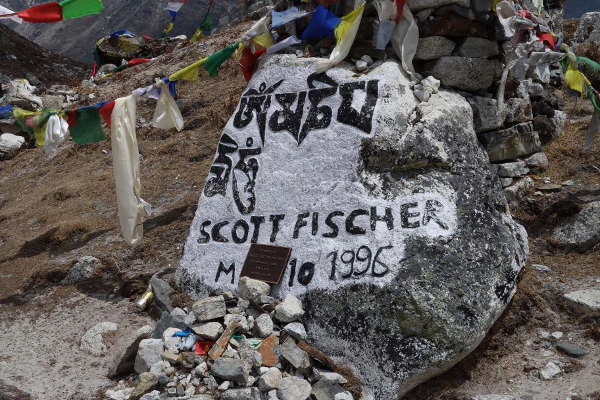 Here, you will rest for a while and have something to eat before climbing further to the Everest Base Camp. The trekker stop point is just before the actual base camp. Most tour groups are not allowed to enter or stay in Everest Base Camp so take the chance to experience the buzz and excitement of the climbing groups is often limited. After getting your iconic picture taken at EBC you will descend back to Gorak Shep where you will stay for the night. Another day of steep trekking allows you to reach Kala Patthar – the highest point on the trek at just over 5,500m. Its location and height result in the best views of Everest, Nuptse and Lhotse in the area. Just hope that the weather is kind to you on this day as it is one of the highlights of the whole trek. 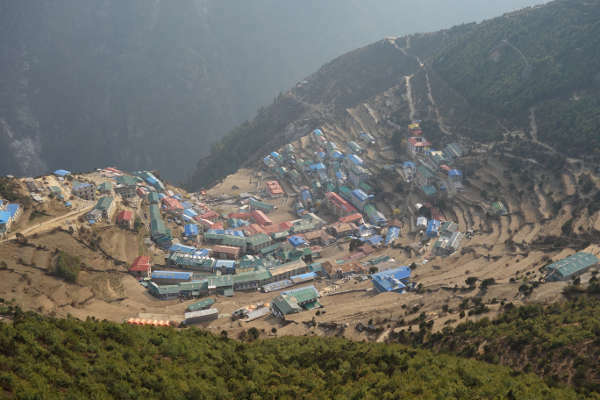 That same day you will descend over 1,000m down to Dingboche where you will spend the night. Return all the way back to Lukla with a long day of hiking. Your last night on the mountain will be spent celebrating in Lukla. Catch the return flight from Lukla to Kathmandu in the morning. Onward travel back home our to your next destination! For a detailed breakdown of costs, see our article on the cost of the Everest Base Camp Trek. Can one trek to Everest Base Camp independently or without a guide / support? Yes, but it is only advised for trekkers that have experience of high altitude multi-day trekking, and are comfortable carry 15-20kg a day. Trekking independently is the cheapest option because you forgo any of the amenities and expertise that is typically offered with a guided trek. You will have to arrange your own domestic flights to and from Lukla airport, and arrange accommodation for each stop in the trek. If you are comfortable organising the logistics of the trek, then this might be an option for you. Should I join a guided trek / group? If this is one of your first high altitude trekking experiences then we recommend using a tour operator and joining a guided group. The typical package will include domestic flights, transport to and from the airport, accommodation for every overnight stop, all permits and passes, porters to carry your luggage and of course the expertise of a guide who will provide you with an insight into the region. Local tour operators are abundant and often cheaper than western operators, but their level of service will be reflected in their price. Hygiene and ethical standards of some of these operators is also questionable. Prices range from £600 ($650) to £1000 ($1300). Western tour operators will provide a much more consistent service. Without cutting prices, they offer affordable yet comfortable accommodation and will employ the best guides in the region who will be able to converse in English. Prices range from £1000 ($1300) to £2000 ($2600). When is the best time to go on an EBC trek? Contrary to what you might think, the best time to go on the Everest Base Camp Trek is not during the height of summer. The spring months of February through May is widely considered the peak season and is when the region is at its busiest. Weather during these months is stable and dry – perfect for trekking and for sightseeing. The mountain is most colourful during this time as well, so you can expect verdant fields and hillsides covered in rhododendrons. September to October is another popular trekking period on the other side of summer that tends to be a little less busy. Another way to avoid the hustle and bustle of peak season is to try some of the trek variations such as the Gokyo Lakes Trek. Trekking in the winter months is still possible, but be prepared for temperatures below freezing. Peak summer is known as monsoon season, characterised by short, sharp downpours. The trails are very wet and trekking during these months is not advised. Read our detailed article on the best time to trek to Everest Base Camp. How difficult is the EBC Trek? Contrary to popular belief, Everest Base Camp Trek is not very difficult. It requires no prior trekking experience or mountaineering skills of any sort. We have seen people from all walks of life, shapes and sizes completing the trek! The round-trip length of the trek is 130km, which is spread over just short of two weeks of trekking. Expect to cover around 15km over 5/6 hours of trekking each day – a very achievable number. The hardest part of the trek is the altitude and the effect that it can have on your body. All good tour operators will factor in acclimatisation days into their itinerary and will aim for a gradual pace of ascent that will ensure your body slowly gets used to the altitude. We recommend undertaking a gym training programme and practice hikes 6-8 weeks prior to embarking on the trek. Read up more on the difficulty of the EBC trek and how to train for the EBC trek. Do I need a visa or permit for the EBC Trek? Yes. If you are a national of a country other than India, you will need to purchase a visa. The 15-day multi entry visa starts at $25 and the 30-day visa goes for $40. The usual guided trek lasts around 15 days, but there is always the possibility of travel delay so we recommending opting for the 30-day visa for a slightly higher price. You will need a Trekkers Information Management System card (TIMS) as well as a Sagarmatha National Park Entry Permit. Tour operators will include both in their price and will obtain them for you beforehand. If you plan to trek independently, however, you will need $20 for the TIMS card and roughly $40 for the Sagarmatha entry permit. Make sure you bring at least four passport sized photos in case they are needed for permits. Will I get altitude sickness on the trek to EBC? Most people who follow the standard route itinerary, take a gradual ascent with acclimatisation days built in and monitor their symptoms will not suffer from any sort of altitude sickness. That being said, altitude sickness is not correlated to age or fitness and can affect some people worse than others. Because it is a potential risk, you must read up about acclimatisation and altitude sickness so that you understand the symptoms and how to prevent them. What should I pack for the trek? Condensing a packing list into one short answer is impossible, so we have compiled a very detailed and comprehensive EBC Packing List guide to help you plan and pack for the trek. It is possible to buy most gear in Kathmandu, but we recommend bringing all the important stuff with you from home. Read our guide for recommendations on what to bring, which brands are trusted as well as items you won’t need during the trek. What insurance do I need for EBC? 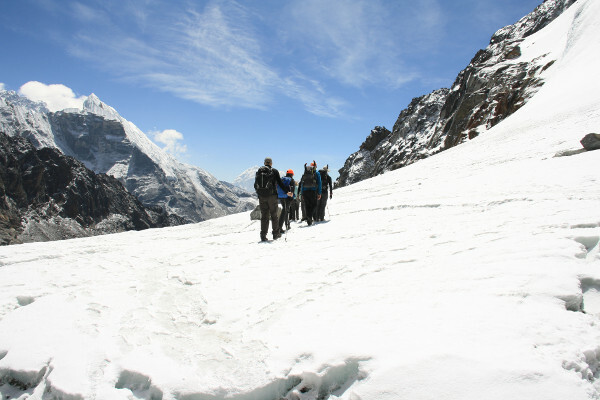 You will need to take out insurance that will cover you for hiking up to altitudes of 6,000m. Typical travel insurance will not cover this so we have compiled an article that will help you find the right insurance policy that adequately covers delays, accidents and altitude related illness. World Nomads provide insurance for treks to Everest Base Camp. Use the calculator adjacent to get a quote. Select the Explorer option and remember to add 'hiking up to 6000m' as an additional activity. Read our detailed guide on travel insurance for the Everest Base Camp Trek. There are a number of route variations for the trek to Everest Base Camp. Below we briefly discuss the three most popular options. One of the more popular variations of the Everest Base Camp Trek, the Gokyo Lakes Trek, also starts at Lukla and follows the classic base camp trek to Namche Bazaar where it forks north-west. The trek proceeds through the towns of Dole and Machermo before reaching the stunning Gokyo Lakes. From there you can ascend to the peak of Gokyo Ri in the north, before crossing the Ngozumba glacier and Cho La Pass and re-joining the classic trek at Lobuche. This variation of the classic trek offers an alternative to flying into Lukla from Kathmandu to start the trek. The Jiri variation starts with an 8-hour bus ride from Kathmandu to Jiri, where the trek begins. The variation adds an extra 5/6 days onto the trip as you trek through the Solukhumbu region and make your way past Lukla, where the trek then follows the same route as the classic Everest Base Camp Trek. It involves a scenic, yet long, bus ride as well as a lot more exposure to the Tibetan and Sherpa cultures. Expect to trek through more forests and streams as you start at the relatively low altitude of 1,800m and work your way up to Lukla and beyond. 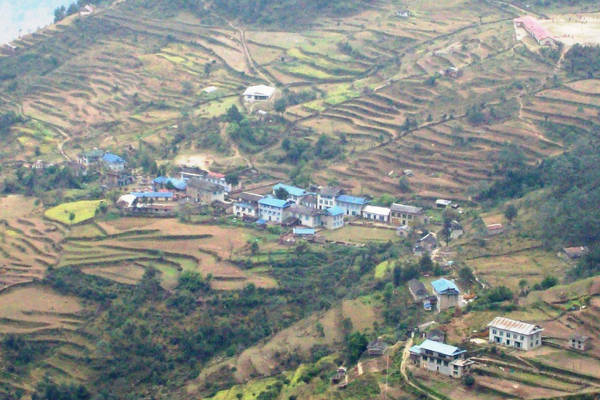 The variation starts by following the classic trek from Lukla to Namche Bazaar before veering west towards Thame and the remote Nangpa Valley. The first of the three passes encountered is the Renjo La, where you will be afforded magnificent views of Everest before descending to the idyllic Gokyo lakes. Island Peak is not so much a variation as it is an expedition in it’s own right. 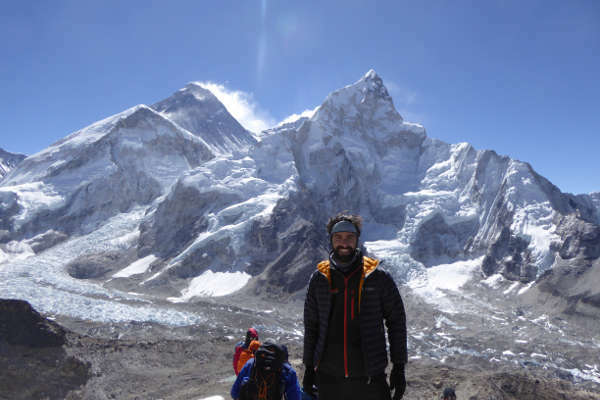 Summiting Island Peak is significantly harder than the trekking any of the routes mentioned above, but it does usually involve a visit to Everest Base Camp to acclimatise before the summit attempt. The climb to the peak is not considered technical although it still requires basic knowledge of jumaring, abseiling, using crampons and ice axes. Standing at just under 6,200m, altitude is a real factor. Most climbers of Island Peak use the traditional base camp trek as a means of acclimatising before heading to the Island Peak Base Camp via Dingboche on the main trail, or by traversing the Chongma La pass. Summiting from the base camp typically takes two days and the whole variation will add around 4 days onto the classic EBC trek. References: EBC Trek Guide is maintained by a group of passionate Nepal guides and independent trekkers, many of whom live in Kathmandu and are experts on the trekking trails to Everest and throughout the region. Much of the site is based off personal experiences which are then cross-referenced with secondary sources like trail and travel guides (i.e. Trailblazer, Lonely Planet), and third party websites. If you find any inaccuracies on the site please contact us. Found this helpful? Please help us keep the site alive - Share it!